Do you like eating a guava? Well, besides the delicious fruit to be consumed as juice, this fruit are popular in indonesia and we called it jambu biji. Guava also turned out to contain a myriad of benefits in it for the content of traditional medicine health of our bodies. In the guava is rich in all the various vitamins and minerals required by our body, especially vitamin C.
Guava contains vitamin C which is a great deal even in a research revealed that 275 grams of guava can accommodate vitamin C to 3 adults or 2 to the children. 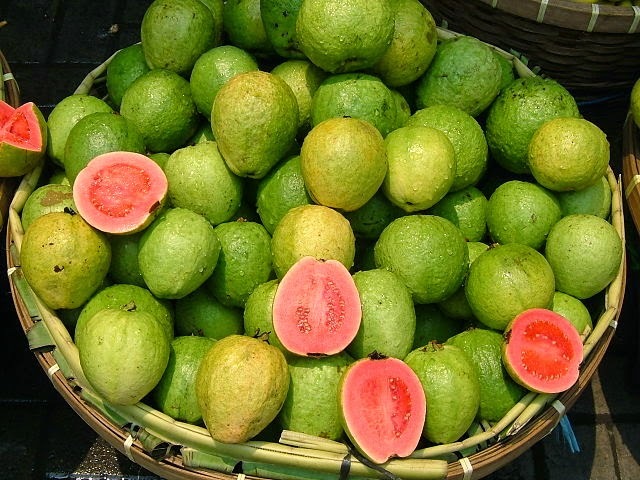 Guava is rich in fiber, especially water-soluble fiber. In addition, the content of guava contains pectin. As we know that the pectin is beneficial to lower cholesterol by binding to bile acids and cholesterol in the body and helps to remove it. Unique guava flavor because of the content of tannins that are beneficial to the digestive system and can accelerate blood circulation, as well as to attack the virus. Potassium contained in this fruit works to increase the regularity of the heart rate, activating muscle contractions, regulating delivery of nutrients to the cells of the body, as well as lower total cholesterol and high blood pressure (hypertension). According to the study, eating guava 0.5-1 kg / day for four weeks, the risk of heart disease can be reduced by 16. Percent. In addition, guava are also useful for treating dengue fever, diarrhea, ulcers, dysentery, and cardiac reinforcement. These are some of the benefits of guava for our health. may be usefull.